The artist known as theartist creates portraits in several styles that are so distinct it might be hard to believe they are from the same hand. His subjects are sometimes famous people in the news, but more often they are the individuals he comes across in everyday small town life. Many of the pieces are painstakingly drawn with pencil on wood. 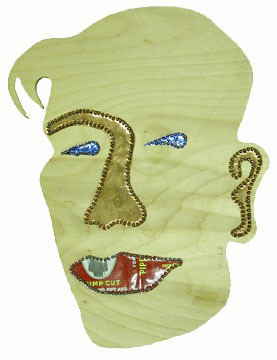 Others have facial features contructed from discarded metal cans and hundreds of tiny nails. Sometimes the figures are super-realistic, sometimes caricatures, sometimes abstract. In his "everyman" portraits, the subjects are represented with simple bodies that share a common size and shape. There are often details about the subject’s life or events in the artist’s own life written in an elaborate graphic style on the front or the back of the portraits. You may see his name signed on earlier work as John Thomas. theartist lives with his dog Theresa whom he refers to as his daughter. An art environment of carefully arranged reclaimed scrap materials is continually evolving inside his fenced yard. "Born 1964, Alabama. Father working for NASA in 1960’s. My mother was pregnant with me and ironing clothes in Texas when our President John F. Kennedy was shot... She came back to Alabama to have me. We like Alabama... I use a lot of recycled items in my art as I love nature. I do not produce my art JUST to make money. Although in our capitalistically orientated society, cash money is a comfort. MANDATORY RECYCLING. EARTH FIRST. NUCLEAR FREE. Joy & Peace to you All. theartist"